Fox & Otter cottages have been beautifully converted from a former stable block at Barmston Farm. 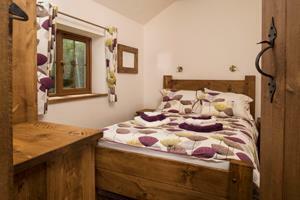 They have hand made rustic wooden furniture throughout, oak beamed ceilings and an open plan living kitchen area. Two bedrooms (sleep 4 one double and a twin) and bathroom with bath and shower over. Private patio gardens complete with table & chairs and a BBQ. Situated on a small, quiet, friendly farm. Two miles from the historic market town of Beverley. Two acre fishing lake. Dairy, Fox & Otter Cottages offers weekly bookings starting on Friday and short breaks of 4 days starting on Monday and of 3 days starting on Friday. From A1174 heading north, pass through the village of Dunswell. Continue on for 2 miles over Plaxton Bridge then a long straight run past Halfway Garage on the left. As the straight run ends on a sharp left hand bend at the church, turn right over the double white lines into Barmston Lane and follow all the way to the end. Heading south on A1174 pass Tokenspire Business Park on the left, then Warton Arms thatched roofed public house. Half a mile further, primary school on the right, then a church on a right hand bend, immediately turn left down Barmston Lane at the side of the church and follow to the very end. (The site cannot be seen from the main road. That is a residential one).